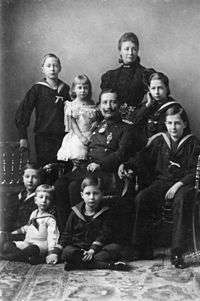 The Naval Laws (German: Flottengesetze, "Fleet Laws") were five separate laws passed by the German Empire, in 1898, 1900, 1906, 1908, and 1912. 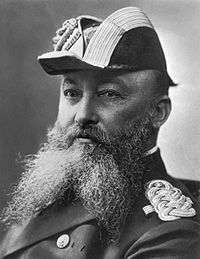 These acts, championed by Kaiser Wilhelm II and his Secretary of State for the Navy, Grand Admiral Alfred von Tirpitz, committed Germany to building up a navy capable of competing with the Royal Navy of the United Kingdom. I had a peculiar passion for the navy. It sprang to no small extent from my English blood. When I was a little boy...I admired the proud British ships. There awoke in me the will to build ships of my own like these some day, and when I was grown up to possess a fine navy as the English. Though Wilhelm loved naval power, he was initially unsure what form the German Navy would take: a force made up primarily of smaller vessels such as cruisers, or larger vessels such as battleships. He initially leaned toward cruisers because they could go to all corners of the globe and display the German flag wherever they went, while battleships were large and cumbersome and thus needed to stay in the Baltic or North Sea. The Secretary of the German Imperial Naval Office, Admiral Friedrich von Hollmann, also favoured cruisers because they were cheaper and more suited to German maritime strategy, which then emphasized coastal defence. However, Admiral Alfred von Tirpitz, the leading proponent of battleships for the German navy, argued that because Germany did not have many colonies or overseas coaling stations, cruiser warfare did not make sense. Rather, it was important to concentrate a large fleet of battleships in close proximity to the strongest sea power, as this was the only way that Germany could compete with Britain (the world's leading naval and colonial power) and thus achieve world power for itself. Tirpitz further claimed that the mere existence of a large battleship fleet would indirectly protect German colonies and commerce the world over, despite the battleships' limited range. The victory of the battleship camp in this strategic debate was cemented when Tirpitz replaced Hollmann as State Secretary for the Navy. On June 15, 1897, Tirpitz unveiled a memorandum that was to alter European history. In this document, he argued that in order to defeat the strongest naval power, a fleet of battleships was necessary. He then proceeded to reverse his argument: if battleships were necessary, Germany's enemy must be the strongest naval power – Britain. Tirpitz's plans were predicated on "risk theory" – even if the German fleet was smaller than that of Britain, it had to be able to inflict damage on the Royal Navy that was severe enough to endanger British dominance of the seas. The losses would be so heavy that another power, perhaps a German ally or British foe, could then swoop in and destroy the remnants of the British fleet. To avoid such a costly naval confrontation with Germany, British diplomacy would become more accommodating towards German colonial and economic desires. Tirpitz felt that such a massive shipbuilding program could only work if its particulars were enshrined in law; this would commit the navy to building a fixed number of ships in advance, ensure that the fleet was built up continuously, and avoid the need to haggle for the money to build each ship in the Reichstag. The stage was thus set for a set of laws that would precipitate the transformation of Anglo-German relations. At the turn of the 20th century, Britain adhered to the so-called "Two-Power Standard": the Royal Navy had to be equal in strength to that of the next two naval powers combined. The standard, long accepted unofficially, was made official by the Naval Defence Act 1889, and designated the French and Russian navies as the most likely adversaries for Britain on the high seas. However, the German Naval Laws advocated by Tirpitz began to threaten this standard. The First Naval Law, introduced to the Reichstag in late 1897, outlined the composition of the fleet by vessel class and the number of ships to be constructed by 1904 and also set a cost limit. It authorized a fixed number of battleships that would not be altered by an annual parliamentary vote, proposing that 16 battleships be built in the following three years. The law passed the Reichstag on March 26, 1898 over the opposition of the Conservative Party and the Social Democratic Party, who were against spending vast amounts of money on naval warfare. Its ramifications were not immediately evident, as the seven battleships it called for would not be sufficient to fight either the British or French navies. Germany's real threat to the Royal Navy began with the Second Naval Law. During the Second Boer War (1899–1902), the Germans greatly sympathized with the Boers, whom they considered a racially and culturally akin people. In January 1900, British cruisers on patrol detained three German mail steamers off the coast of Africa to search them, suspecting them of carrying materiel to the Boers. Although the British quickly apologized, the Germans were outraged, and Admiral von Tirpitz took advantage of the anger to introduce a new naval bill, which passed through the Reichstag with very little opposition on June 20 of that year. This law doubled the size of the fleet from 19 to 38 battleships; two flagships, four battle squadrons of eight battleships each, and four reserve battleships were to be constructed over seventeen years, from 1901 to 1917. This law made clear that not only was the German Navy to be a powerful battle fleet instead of a coastal defence force (in the process turning Germany into the second-strongest naval power in the world), but that the primary opponent of this enlarged fleet was to be the United Kingdom. The next 12 years saw the Reichstag pass three more Naval Laws, in 1906, 1908, and 1912; in each case, Tirpitz took advantage of a sense of crisis and alarm in Germany to ensure the success of the legislation. In June 1906, the Third Naval Law, mandating the construction of six large cruisers, became law following the German failure to break the Entente cordiale at the Algeciras Conference. The Fourth Naval Law of April 1908 pared down the age at which battleships were to be replaced from 25 to 20 years, and was sparked by a feeling that King Edward VII and Great Britain were trying to encircle Germany. The Fifth Naval Law, sparked by the German retreat in the Agadir Crisis of 1911, passed in June 1912 and added three more battleships to the building program. The naval policy of Germany is definite and persistent. The Emperor seems determined that the power of Germany shall be used all over the world to push German commerce, possessions and interests. Of necessity it follows that German naval strength must be raised so as to compare more advantageously than at present with ours. The result of this policy will be to place Germany in a commanding position if ever we find ourselves at war with France and Russia...Naval officers who have seen much of the German Navy lately are all agreed that it is as good as can be. The more the composition of the new German fleet is examined, the clearer it becomes that it is designed for a possible conflict with the British fleet. It cannot be designed for the purpose of playing a leading part in a future war between Germany and France and Russia. The issue of such a war can only be decided by armies on land, and the great naval expenditure on which Germany has embarked involves deliberate diminution of the military strength which Germany might otherwise have attained in relation to France and Russia. As a result, the British began to shift their foreign and naval policies to meet the German threat. From 1902 onward, an Anglo-German naval arms race developed as the Admiralty advocated the Two-Power Standard plus an additional six battleships over and above parity with the French and Russians. Diplomatically, the British forever abandoned Splendid Isolation by concluding the Anglo-Japanese Alliance in 1902, then followed it two years later by signing the Entente cordiale with their long-time rivals, the French. With the signing of the Anglo-Russian Entente in 1907, the German fear of encirclement became a reality. Under Sir John Fisher, who served as First Sea Lord from 1904 to 1910, the Royal Navy underwent a period of revolutionary change. Since the autumn of 1902, Fisher had viewed Germany as Britain's principal naval enemy, and so he redistributed the Fleet such that the biggest and most powerful ships were situated for battle against the Germans. The Home Fleet was renamed the Channel Fleet and ordered to remain in the proximity of the English Channel, while the former Channel Fleet, based at Gibraltar, was redesignated the Atlantic Fleet. Four battleships transferred from the Mediterranean Fleet and five from China enlarged the Channel Fleet to 17 battleships, while the eight battleships of the Atlantic Fleet could move north toward the British Isles or east into the Mediterranean Sea. Signed into law 10 April 1898. 3 large cruisers and 10 light cruisers for foreign service. light cruisers after 15 years. 30 light cruisers (23 existing, 7 additional vessels to be built). Signed into law 14 June 1900. 96 torpedo boats in 16 divisions of 6 boats each. Approved 27 March 1908; authorized strength of fleet remained unchanged, but decreased replacement age of battleships to 20 years (thereby speeding up the construction of modern vessels) and mandated new large cruisers be battlecruisers. 30 light cruisers (18 active, 12 reserve). 72 submarines (12 year replacement age). ↑ "Feature Articles: The Causes of World War One". FirstWorldWar.com. 2004-03-27. Retrieved 2009-08-01. ↑ "Who's Who: Kaiser Wilhelm II". FirstWorldWar.com. 2004-05-15. Retrieved 2009-08-01. ↑ "The Great War and the Shaping of the 20th Century: Kaiser Wilhelm II". Retrieved 2009-08-01. ↑ "Admiral of the Fleet Sir John Fisher, 1st Baron Fisher of Kilverstone 1841-1920". Royal Navy. Retrieved 2009-12-27. ↑ Full text of the 1898 law(in German). ↑ Robert Gardiner, ed., Conway's All the World's Fighting Ships 1860-1905 (London: Conway Maritime Press, 1979), p. 241. ↑ Full text of the 1900 Law(in German, including a list of ships). ↑ Robert Gardiner, ed., Conway's All the World's Fighting Ships 1960-1905 (London: Conway Maritime Press, 1979), p. 241. ↑ Robert Gardiner, ed., Conway's All the World's Fighting Ships 1906-1921 (London: Conway Maritime Press, 1985), p. 164. ↑ R. Gardiner, ed., Conway's 1906-1921, p. 134. ↑ R. Gardiner, ed., Conway's 1906-1921, p. 135.